I welcome you members of the press to this August interactive session on the state of security in our country and our contribution to the efforts of well-meaning stakeholders to proffer solutions to the current challenges. We have followed the current security situation in the country, especially in parts of the middle belt region, leading to the death of a number of our compatriots. We have further observed with dismay the attempts by some vested interests to politicise what ordinarily ought to be a national disaster on the singular note that they are in search of cheap political points. We express our heartfelt sympathies for those who have lost their loved ones and urge all Nigerians to embrace the peaceful coexistence that has been the hallmark of our country over the years. We assure them, that the government of the day is working assiduously to ensure that these killings are brought to an end and urge the people to cooperate with the security agencies to bring lasting peace to troubled spots. While anger at this time may be understandable, we must not allow emotions to becloud our sense of judgement. The people of these areas which have been affected by the onslaught of enemies of our national unity must not allow themselves to be used by opportunists and sponsors of these senseless killings to achieve their selfish aims that have nothing to do with the long-suffering people of Nigeria. We have observed the attempts to bring the person of IGP Ibrahim Kpotum Idris into these killings to use it to further their opposition of the good works being done by the IGP and his team. The smashing of the notorious kidnapping gang of Evans and others in his gang wouldn’t have been possible had the IGP not been hands-on in the discharge of his primary duty of protecting lives and property of Nigerians. 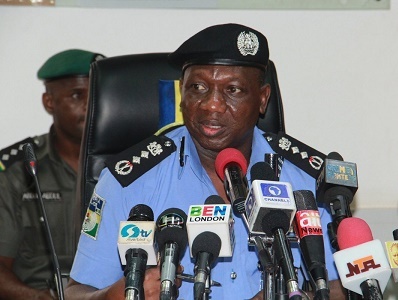 While IGP Idris' calls for expanding and reforming the police force have been met with deafening silence, we find it curious that a tragedy of these scale would be used to further deride the work of the police force and undermine it’s genuine efforts to address the current challenges. It is on record that arrests have been made in connection with the recent incidents in Plateau state by the Joint task force in collaboration with the police, and we urge all the agencies involved to speed up investigation and action on the matter to bring closure to the people. We as students, having been beneficiaries of the prompt attention given to security issues on our campuses by the current leadership of the Police, pass an unwavering and unalloyed vote of confidence on the leadership of IGP ibrahim Kpotum Idris, and urge the fine officers under him not to allow the present challenges to deter them from carrying out their duties of building a 21st century police force capable of handling the security problems of Nigeria. The leadership and membership of the Concerned Nigerian Students will not relent in demanding for a better Nigeria and working assiduously with all who support our cause and share our vision of a new Nigeria. We urge the perpetrators of these senseless killings to desist from their selfish and inhumane course, as the long arm of the law will soon catch up with them. All politicians should, in the interest of the average Nigerian, support the work of the security agencies and give backing to the IGP’s call for improved funding as well as expansion to provide better equipment and manpower needs of the force. We call on the IGP to continue with his onerous task of policing a multidimensional society such as Nigeria and avoid any form of distractions from any quarters whatsoever, as Nigeria is bigger than any sectional or other interests. We call on the presidency to continue to empower the police and sustain the support so far given to the force to deliver on its primary responsibility to the Nigerian masses. We call on all Nigerians to remain calm and go about their lawful daily activities, while never hesitating to provide useful information to aid investigations and protection of life and property of all Nigerians. Security is everybody’s business and all hands must be on deck to ensure that criminals have no safe spaces to operate within the borders of Nigeria.